Hulk 2 or not Hulk 2. Is that a question? Marvel Studios may not want to hear the answer. 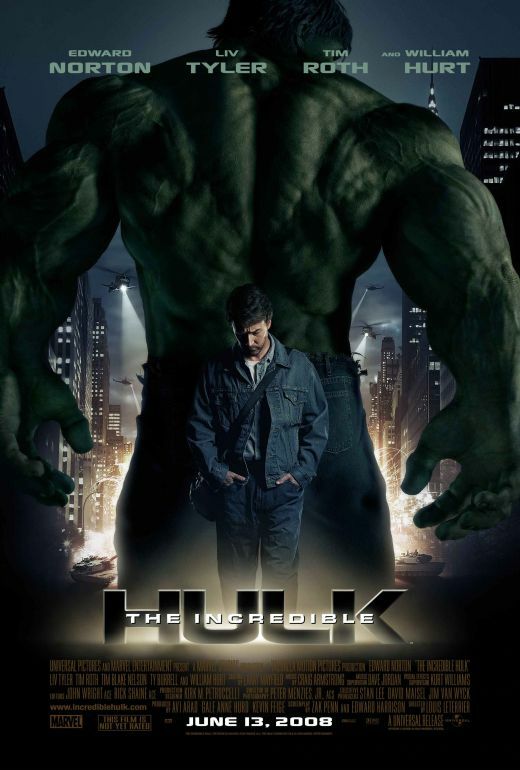 Hulk from 2003 did not perform to expectations at the box office starring Eric Bana as Bruce Banner and Jennifer Connelly as Betty Ross. The two antagonists were David Banner played by Nick Nolte and Sam Elliott was General Thaddeus Ross. The Incredible Hulk reintroduces Edward Norton as the dual protagonist of Bruce Banner & Hulk in Brazil where the first feature film left our conflicted scientist. Liv Tyler is now Betty Ross, and the antagonists are William Hurt reprising the role of General Thaddeus Ross and Tim Roth is Emil Blonsky who becomes the unnamed Abomination villain. Although the storyline retains elements from the 2003 film, the 2008 sequel does not necessarily break completely away like the successful Dark Knight revision of Batman. The tension generated by a lost romance between Bruce and Betty is what humanizes The Hulk, but Hulk 2 fails to ignite a similar appeal as passionate as Iron Man or Spiderman. One issue of concern is the preoccupation with violent fight sequences. Rampaging among the citizenry is bad form. The fire power used against The Hulk and Blonsky to stop them is immeasurable. Guns and copious amounts of ammunition should not be the only plot device available to carry this flick. The jolly green Sasquatch was one of several popular comic book characters created by Stan Lee, first published by Marvel Comics in May 1962. Making the transformation from print onto the silver screen has proven to be difficult for The Hulk. Hollywood spindoctors have tweaked his origin twice now and finding a broader audience remains evasive. Hulk creator Stan Lee enjoys interjecting a cameo appearance. In the first Hulk film, Lee played a security officer and in Hulk 2, Lee opens a soda bottle tainted with Gamma blood residue. This bio-contamination alerts General Ross as he prepares a stealth military assault to recapture The Hulk. Lou Ferrigno who portrayed The Hulk in the 1977 television adaptation returns as a security officer. Even the late Bill Bixby was fondly remembered in a brief t.v. screen glimpse as Bruce was changing the channels. It's interesting to note that Bixby and Ferrigno reprised their roles in three Hulk programs made after the series was canceled. Both Thor and Daredevil from the Marvel stable of characters were featured in two of these episodes. As a surprising epilogue, Tony Stark confronts General Ross in a bar downing shot after shot. This short scene sets the stage for a future & major Marvel Studios production to present The Avengers in a full length feature. Downey's innate hipness is just so cool. His small bit injects a hint of humor that Hulk 2 lacks entirely. How will The Hulk interact as part of a team of heroes when Banner is assuredly a loner? Marvel Studios has faith in this scenario.